Several of my freinds and I have been knitting for a good cause: The Tulsa Air and Space Museum & Planetarium. TASM is hosting their annual fundraiser, The Aviator Ball, next month and so MrsD, KnitterforPeace, Harriet and myself have been clicking needles in support. The results will be up for auction at the ball. 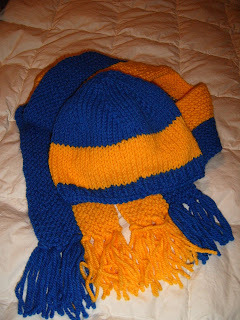 MrsD produced the University of Tulsa Hat (pictured) and I made the matching scarf. KnitterforPeace donated the gorgeous Northern Lights Scarf (pictured), Harriet made a fantastic OSU scarf (picture to come). MrsD is also hard at work on a fantastic and dainty Midnight Sky shawl. Colorcrazed will be creating an OU scarf when she returns from spring break and Eaglechic is still contemplating her creation. Whew! That's a lot of support! My DH (the Planetarium director) and I really appreciate it, ladies. Thanks! 918-834-9900 or at the link above.